Today when I woke up and opened the door to the balcony, I saw that my orange hibiscus plant had sprouted two flowers. They looked so fresh and beautiful that my day was made. There was a bud on the white one and I expected it to bloom by tomorrow. But after I had had my morning cup of coffee, I saw that the white one had bloomed as well. The weather was gloomy this morning, here in Bangalore, around 7 am. But past 8 am, the flower was open and pristine white in color. My day got more better. Cal and I are first time gardeners and we bought in a few plants when we moved into a place of our own. We stay on the third floor and the plants are put up in the balcony. And we love tending to them. We water them everyday day and talk to them. Every time one of them has a bloomed flower, we go crazy. And incredibly happy. It is nice to see a beautiful life grow in front of your eyes. Now, we are all set to grow some organic vegetables as well. Now you must be thinking why am I talking about plants suddenly. 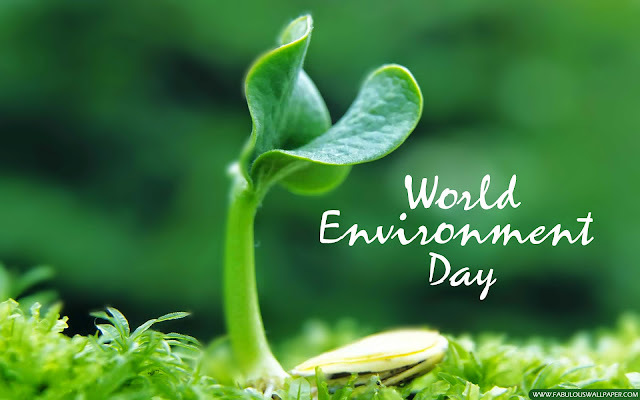 Today is World Environment Day, and I for one love the environment I stay in. I have a beautiful house and a loving husband, my house is clean and organized, my plants are blooming well and I have everything going my way. But what about the outside environment? If only I could say the same about it. As I walked up to hail an auto to get to my workplace, I saw the garbage strewn around in the corner of my lane. That is when I realized that no matter how careful I am at home, I might be prone to so many other things once I am outside. Be it the street or the air. Or the water. Nothing can be trusted these days. Even our loyal maggi, finally gave up on us. Bangalore has now become a concrete jungle and most of the canopy of trees and parks have now made way for offices and apartments. We cannot halt the modernization process, but we sure can do our bit to make the world a better place. For our future and our future generation. I do not want to sound preachy here so I would just talk about a few things that I am going to follow from today. I would love to be a green warrior and go out there and clean roads and lakes. But I hardly have the time to do anything apart from work and house work these days. I am a realist and I want to set realistic expectations. And I do not want to look at the world with rose tinted glassed anymore. Why? Because those glasses have a layer of grime on them now. ~ I will never switch on the geyser for longer than necessary. ~ I will not use the shower. I shall use a bucket of water only. ~ I will separate the dry waste from the wet waste and dispose them appropriately. ~ I will grow more and more plants. This clears the air around the house and brightens up our life as well. ~ I will switch off the lights when not in use. ~ I will remove the charger from the phone and laptop once it has been charged. ~ I shall adjust the temperature of my fridge, along with the seasons. ~ I will not cave in to my unnecessary urge to bake every now and then. The oven consumes a lot of power. ~ I shall walk short distances instead of taking an auto and polluting the air. ~ I shall report vehicles emitting a large amount of smoke. ~ I shall recycle everything that can be recycled. ~ I shall work on incorporating rain water harvesting in my house. ~ I shall dispose of electronic waste efficiently. It does seem like a huge list, but it is not difficult to achieve it. Today as I live a wonderful life, I want to make sure I live longer. So that I can love the people I love longer. And I need to keep the environment clean for that. This is my first baby step, in trying to make the world a better place. If all of us take just one step forward to do something like this, soon we will have a much cleaner and better earth to live in. Well said - if we all take those baby step, things can get so much better. Gardening is something I discovered recently and I'm absolutely in love with it now. I need to put in my vegetable seeds soon. Yup! Baby steps are the ones that matter. Little things can make a lot of difference over a period of time. How I wish everyone realized their responsibilities towards the environment and did their bit! It is a sad thing that some people do not get the basics. I gave a self nod as I read every line . Living longer with good health has becoming a every day challenge . I picked up few Do's and Dont's from the list, I am sticking to them as well . About the gardening excitement? Same pinch:) the tulips in my gardens are blooming too . I always find a lot of things common between us :) hugs!! Great initiative and pledge for a better society. Fantastic initiatives. Delhi is so very polluted, the lungs burn at times. I keep nondrying how much the pollution will go down if we start sharing vehicles or using the metro ! We all should do something about it. I like the list. I will make sure I follow it too. Bangalore was beautiful before. Summers were never as hot as they are now. It is turning into a concrete jungle. Hyderabad on the other hand has always been stones but people here are planting trees now and trying to make the city greener. Hopefully it works :). PS - For some reason your posts aren't showing in my blogger updates. Need to check that. Hyderabad is beautiful as well. Towards the Banjara Hills side. I try to do my bit as well, but sometimes even the government doesn't support us. In Bahrain, we don't have seperate disposal system for perishable and non-perishable. The newly constructed buildings switch on their lights for display purpose. Since our electricity bill is incorporated in the rent, people sometimes even leave the air-conditioners on even when they are not at home. I can go on and on. It is ridiculous how people are so ignorant even in this day and age. That is so so bad. Just because its is paid for doesn't mean you waste it right? When will people ever realize that the resources might end soon.